This was Sidney Crosby’s first two-goal game since October 28th, 2014 against the New Jersey Devils. The Penguins are now 6-7-2 against the Metropolitan Division. They are 20-4-3 against the rest of the league. David Perron netted his first power-play goal since April 8th, 2014. Since his overtime-winner in Montreal, Sidney Crosby has six points (2G, 4A) in two games. 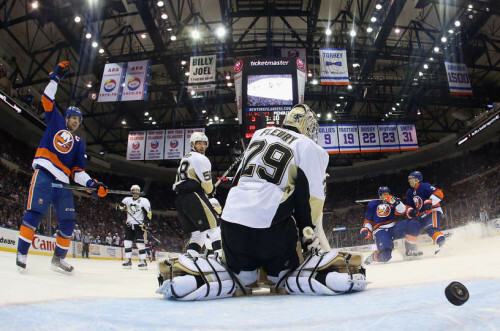 Both goals came against the New York Islanders and can easily be attributed his comfort around the goal line. We haven’t seen Crosby feel comfortable around the blue paint or the goal line for quite some time now. But if there’s on positive to take from last night, it’s the Crosby is comfortable again. He’s scored some insane goals from the goal line and hanging around the backdoor at impossible angles. Another day in the life of the best in the world. The Penguins’ power-play also had some success. They managed to net more that one power-play goal for the first time since November 8th. Just simply getting a good shot on net (Perron) and getting in around the blue paint (Crosby) was all it took for the Penguins to finally find some success on the man-advantage. The Penguins looked reminiscent of a Bylsma-coached team at times. If there is anything to take away from the previous two meetings between these clubs, it’s that the Islanders have speed. Mike Johnston’s system can effectively slow down the as long as you have possession. The trouble is, the Penguins decided to come out of the gate with everything they had and spectate as the game went on. Lazy cross-ice passes lead to turnovers going the other way, giving the Islanders more than enough chances. The Penguins need to stick with their system at all times. These lapses will obviously cost them in an intense game like this. They aren’t as young or as fast as the Islanders. They need to dictate the pace of these kind of games whenever they get the chance. I’m preaching to the choir here, but the fourth line needs a makeover pronto. The Penguins want to be a team that can roll all four lines. They want to look like the Stanley Cup Champion Los Angeles Kings. They want production from everyone. You won’t get that production with Craig Adams or Zach Sill hindering your line-up. Unfortunately, that may require some patience. Patric Hornqvist and Blake Comeau returning to the line-up should finally fill out the roster and evenly distribute some level of talent to all four lines. The only question is, will the Penguins actually scratch Adams and Sill? You may notice I didn’t bring up Steve Downie’s penalty here? Other than Crosby’s goal in the final seconds of the second period, the Penguins hardly produced anything for the final 40 minutes of the game. Sure, Downie took away two minutes off the clock for the Penguins to try and tie it, but they had 38 other minutes to get control of the game and score the equalizer. Can’t make Downie the scapegoat for that. Stick to the system and keep Crosby down low around the goal-line. You can’t really ask for much more than that. Had the Penguins sticked to the system for an entire 60 minutes, the outcome of this game could have been very different. The Penguins are back at CONSOL Energy Center on Sunday at 12:30pmET for another Metropolitan matchup against the New York Rangers.